The Rockefeller Gardens on the Halifax River, is a lovely location for this wonderful local festival, featuring mouth watering seafood dishes from local restaurants, and a wide variety of local bands performing on 2 stages, and a jam tent. This Annual event comes around the third weekend in June. The kid's were having a really nice time in this large fenced in grassy field in front of the Casements where the Children's Area resided. Boy Scout Troop 403 out of Ormond Beach was there to lend a hand, helping the small children in the bouncy house area. The Children's Area offered several bounce houses and obstacle choices to choose from. The Children's Area also had free balloon art, and facepainting. The seafood dishes were fabulous. Visitors enjoyed steamed blue crabs, seasoned shrimp, mussels, clams, crabcakes, fish, and even gator tail. There were so many different kinds of seafood to choose from. One of the highlights of the festival was the Hermit Crab races. People were cheering their painted Hermit Crabs to the finish line! 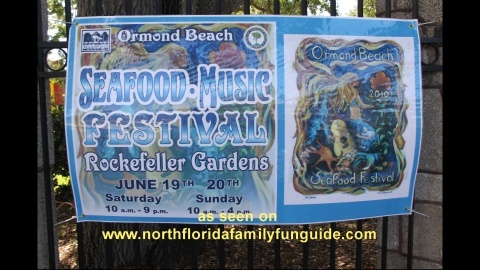 If you come to this festival for the seafood, as good as it is, you will stay for the wonderful variety of music on 2 stages. The jam tent also encourages visitors to bring their own instruments and join in a jam session, and share songs around the circle.